Jarawas live in the jungles of Middle Andaman on the west side of the Andaman Islands. The construction of Andaman Trunk road (ATR) has pushed Jarawas on one side of the island and constant poaching of their game and honey by the city dwellers often leaves them without basic subsistence. Jarawa language had been an isolate for very a long time and hence without any conceivable interference due to language contact. The animosity between the Jarawa and the Great Andamanese had been known especially in the 19th century, without any social contact whatsoever. However, this period of long feud does not reflect in any language intervention or perhaps it is safer to say that it escaped our attention. The name “jarawa” is given to this tribe by the Great Andamanese which means ‘strangers’ in one of the ten languages once spoken. Some young Jarawa boys do frequent the Andaman Grand Trunk road now and have picked up a few Hindi words such as /do/ ‘give’, /jana/ ‘to go’ etc. Almost the entire community of Jarawa is monolingual. This is the only tribe which has remained a hunter and gatherer in the true sense as the Jarawas are not dependent on government subsidy of any kind, and hunt in the sea or in the jungle and do not wear city clothes unless they are provided by the government officials for bringing them into Port Blair. Clothes by the Indian government are distributed also when the officials/social workers visit the forest. This has changed as the goodies to be gained from tourists have become part of the Jarawa economy; erstwhile hunters and fishermen are now equally often asking for tobacco and food from sightseeing visitors. The Jarawa language has only been studied by linguists quite recently…and it is already being augmented by Hindi. 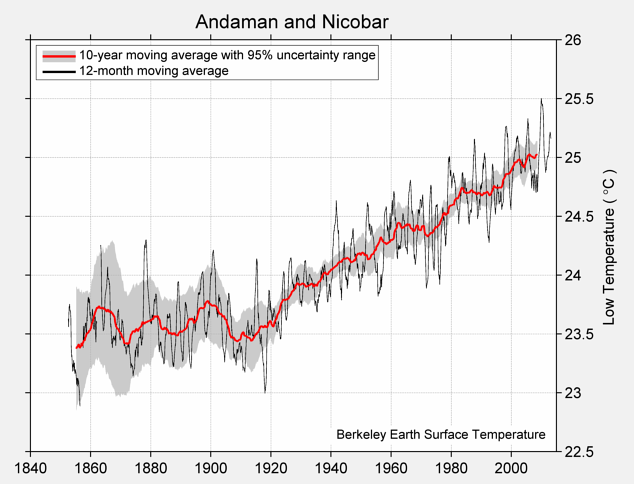 These changes are partly due to the construction of the two-lane Andaman Trunk Road which connects parts of the islands while running right through Jarawa territory, leading to increased mixing of outsiders and tribals — with some consequences that could have been predicted, such as previously-inconceivable outbreaks of measles and malaria. “Many of the Jarawas, especially the younger generation, are now too accustomed to their present way of life, they may just refuse to go back to their hunting-gathering ways,” said Amlan Dutta, an environmentalist who was followed the developments closely. 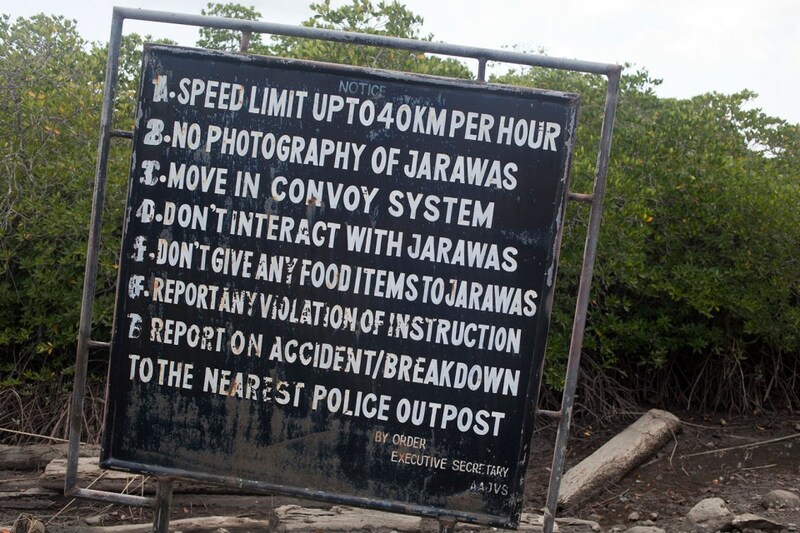 Significantly, those advocating isolation for Jarawas maintain that the only way to protect the them is by closing the Andaman Trunk Road altogether, which would immediately stop the human safaris and interaction with outsiders. But such a move has met with stiff resistance from the local people for whom the trunk road is the only option to access remote parts of North and Middle Andaman on land. “Any decision to close down the ATR will have serious fallouts for settlers,” said Paritosh Halder, who runs a grocery store in the town of Rangat in Middle Andaman. “Thousands will be deprived of livelihood and quick access to emergency services which are only available in Port Blair,” he said. There is relatively little known about Jarawa music, given the many years when gaining access to their culture without facing a storm of spears and arrows was all but impossible. I saw that the Jarawa shared everything among themselves. Game, once hunted, is eaten by everyone. If they like something, they take it, because the idea of personal property does not exist for them. This is often misconstrued as theft by outsiders. But in reality, it is just a misunderstanding between cultures. They name themselves after objects like stones, snakes, etcetera, and don’t count beyond three. So, after today, yesterday and the day before, everything is in the ‘distant past’ for them. They live in huts partitioned for nuclear families. Spaces within the hut are reserved for different units. The family only includes the father, mother and children below six or seven. Past that age, boys and girls live apart in separate camps for girls and boys. Their marriages are fixed in childhood and consummated once they turn 16 or 17. But even then, they have to prove themselves. Boys have to hunt and girls have to go out and gather food before the marriage takes place. The tribe members dance and sing a lot while they are doing many activities. Some of these are hunting, fishing, and collecting honey. Other people crowd around and sing traditional songs. They also dance and sing when gifts are brought to them by outsiders, such as clothes and food. The instruments that they use are drums. The ethnomusicologist in me desperately wants to know more about their music: how it’s organized, how it’s conceived, how it’s transmitted. But if I have a choice between analyzing it and leaving it alone…I’ll leave it alone. And do you need to know that these islands are terribly vulnerable to the rising sea levels of catastrophic climate change?